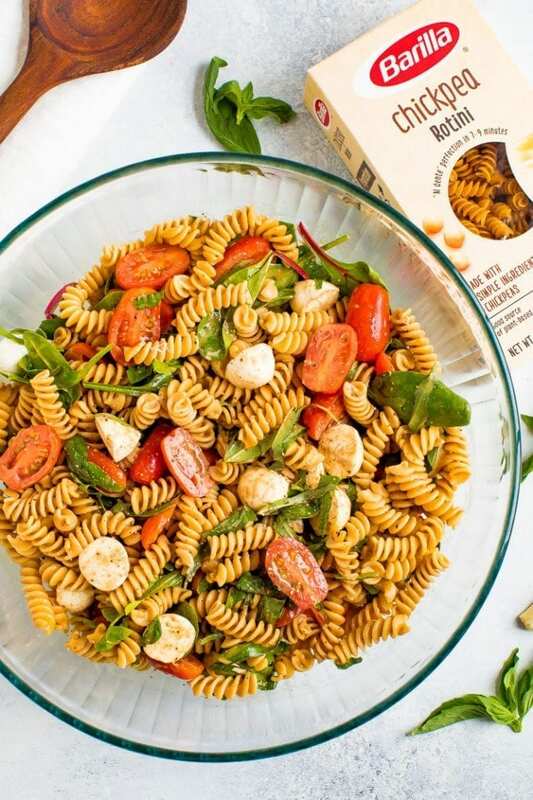 Caprese pasta salad made healthy with protein-packed chickpea rotini, tomatoes, fresh mozzarella, arugula, fresh basil and a delicious homemade balsamic dressing. This post is sponsored by Barilla®. The list goes on! I’m making it my mission to make meal prep more approachable. I’m here to show you that healthy eating doesn’t have to be boring. You can meal prep effectively without eating the same thing every week and without spending all day in the kitchen. 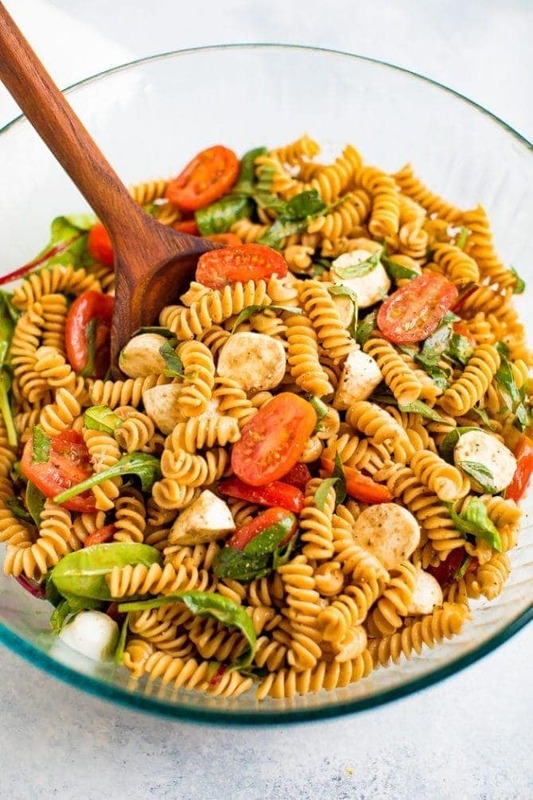 Case in point: this pasta salad recipe that is perfect to make ahead! The entire recipe can be made in advance and if I’m being honest, tastes even better after marinating for a couple days. 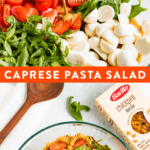 The base of this caprese pasta salad is (you guessed it) my new favorite pasta, Barilla legume pasta. 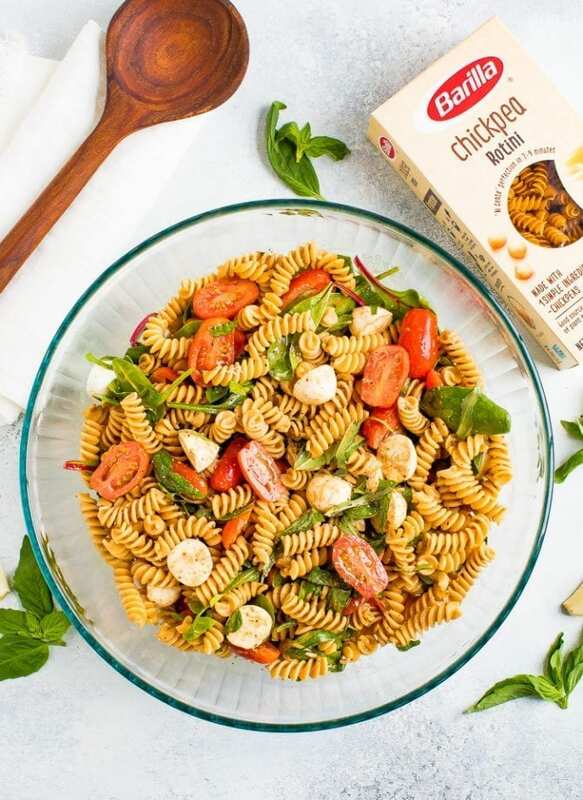 I used their gluten-free, protein-packed Chickpea Rotini, which is made with one simple ingredient – chickpeas. To top it off, Barilla legume pastas are an excellent source of fiber. It’s truly a triple threat. If you’re interested in seeing why I’m so hooked on it (or using it for this recipe) you can find Barilla’s legume-based pasta on Amazon. Now let’s talk about this dressing. Ohhhh man I’m obsessed with this dressing. 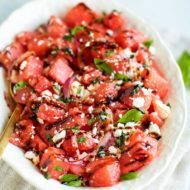 It’s my go-to balsamic dressing that you’ve seen time and time again here on EBF. I love the sweet and tangy flavor. 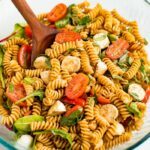 As I mentioned before this pasta salad is great for meal prep. Follow my three simple steps below to make the salad, then divvy up into separate meal prep containers. Put in the fridge and enjoy for multiple days! 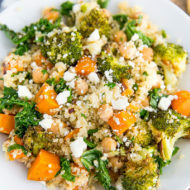 Of course, this salad is also perfect for potlucks and parties! The recipe makes plenty and everyone loves it. 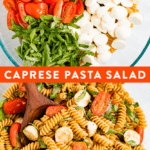 If you make this caprese pasta salad please be sure to leave a comment and star rating below. 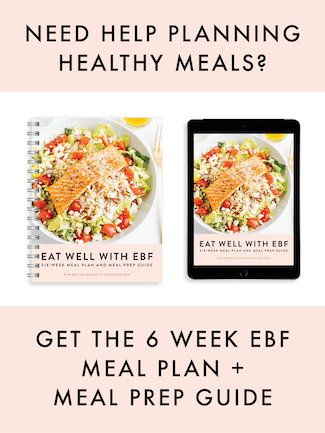 Your feedback is so helpful for the EBF team and for other EBF readers who are thinking about making the recipe. 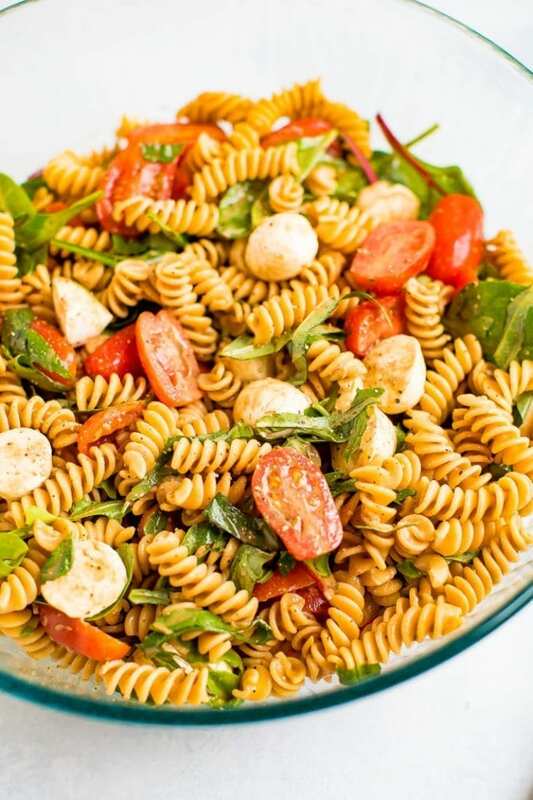 Caprese pasta salad made healthy with protein-packed chickpea rotini, tomatoes, fresh mozzarella, arugula, fresh basil and a delicious homemade balsamic dressing. 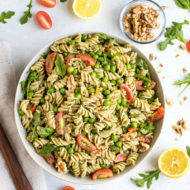 Bring a large pot of lightly salted water to a boil; cook the chickpea rotini at a boil until tender yet firm to the bite, about 8 minutes; drain. 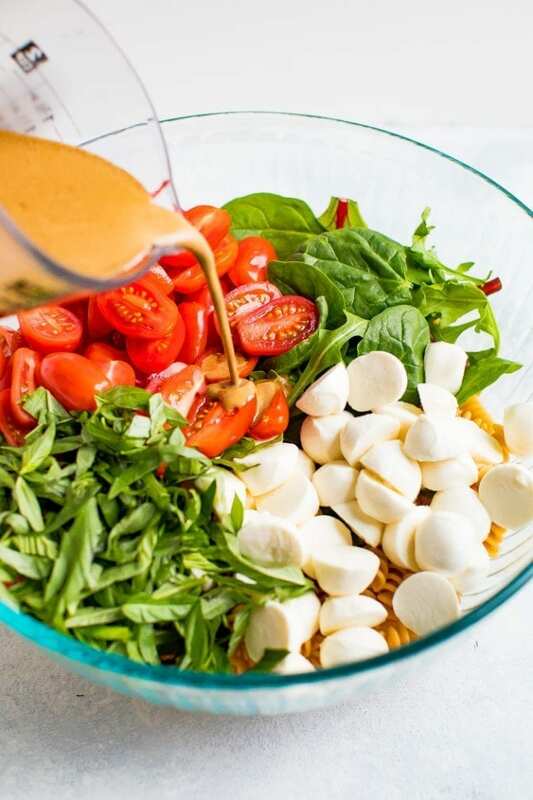 While pasta is cooking, make your balsamic dressing by adding all the ingredients into a blender. Blend until emulsified. 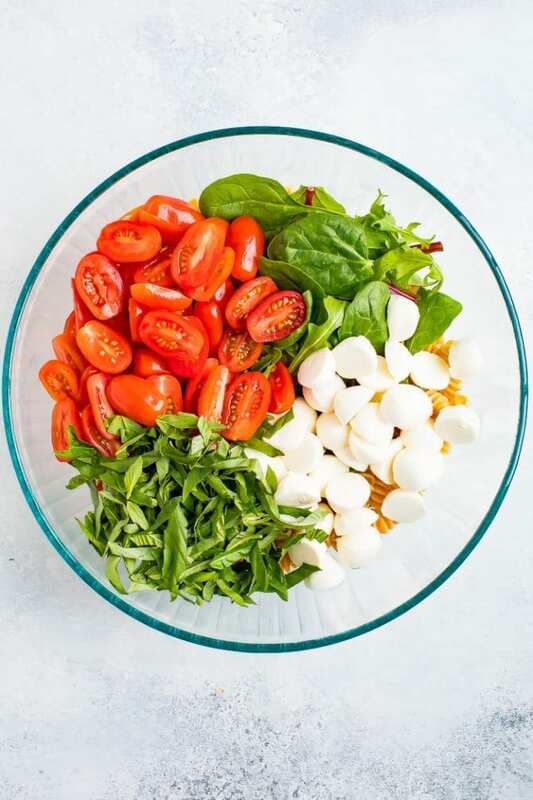 Add cooked pasta, tomatoes, mozzarella, baby arugula and fresh basil into a large bowl. Add dressing on top and gently toss to coat. Taste and add additional salt and pepper, if needed. Serve right away or place in the fridge to chill before serving. Store in fridge for up to 4 days.